Thermal Controlled battery charge circuit, One way to charge batteries rapidly without abuse is to measure cell temperature and tapper the charge accordingly. The circuit uses a thermocouple for this function. 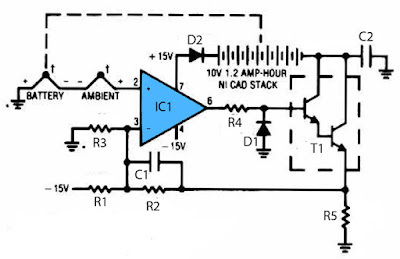 A second thermocouple nulls out the effects of ambient temperature. The temperature difference between the two thermocouples determines the voltage , which appears at the amplifier's positive input. As battery temperature rises, this small negative voltage ( 1 degree Celcius between the thermocouples equals 40uV ) becomes larger. 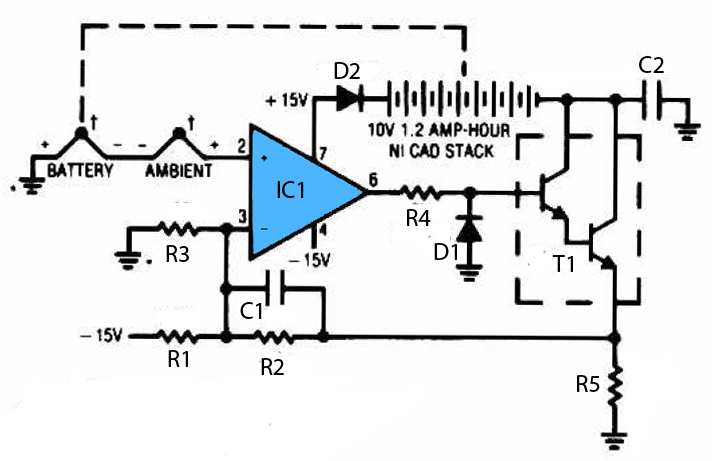 The amplifier, operating at a gain of 4300, gradually reduces the current through the battery to maintain its inputs at balance. The battery charges at a high rate until heating occurs and the circuit then tapers the charge. The values given in the circuit limit the battery-surface temperature rise over ambient to about 5 Degree Celcius.